After the Noah plaque, Verdun altar, Klosterneuburg, Austria, 1181. [“Frozen Assets”] depicts Depression-racked New York in four tiers: skyscrapers, a homeless shelter, underground pipes, and a bank vault. It can seem a mere polemical illustration; but, given thought, it becomes a distillation of history with a carefully measured, unexhausted potency. It doesn’t tell us what to think, only what must be thought about. Dieago Rivera, Frozen Assets, 1931. Assignment I from Writing Metrical Poetry by William Baer. To baleful vaults of stone. To fears repressed and known. 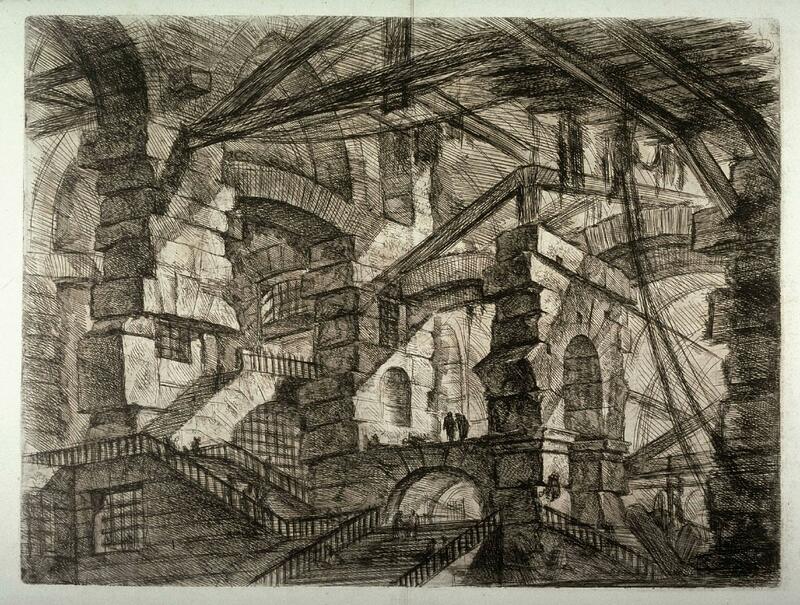 Giovanni Battista Piranesi, Carceri, plate XIV, "The Gothic Arch", 1750. From the Nelson-Atkins Museum collection, Jan Steen, Fantasy Interior with Jan Steen and the Family of Gerrit Schouten, c. 1659-1660. In keeping with the theme of yesterday’s post here is another great work from The Neslson-Atkins Museum of Art: Jan Steen’s, Fantasy Interior with Jan Steen and the Family of Gerrit Schouten. Like many paintings from this region in the 17th century, I am immediately attracted by its symbol saturation. This painting is trying to tell you something. I particularly relish how overt some messages continue to be and how other allusions have become obscured by the passage of time.